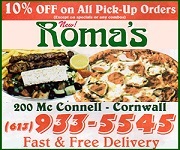 Cornwall Ontario – This time of year never fails to bring back old memories when we were kids. It all depended on the weather and if the sidewalks were mostly clear of snow except maybe for little ice chips in the cement. We could hardly wait to get outside and play. We would be playing marbles on the sidewalks as soon as we could. Some of us carried our marbles in the purple Seagram’s Crown Royal bags. A friend said that she heard that playing marbles is not allowed on school grounds as it is now considered ‘gambling’. In my day no one was ‘gambling’. All we had to lose might be a marble or two. Maybe that is where the expression came from: ‘losing your marbles’. We also played Bolo Bat and tried so hard to not miss hitting the little ball with the small bat. ‘Hopscotch’, ‘hide and seek ‘, ‘cops and robbers’ and ‘tag’ came a bit later as the weather warmed up as did Roller Skating. We had to make sure we had that ‘key’ on a string around our necks in case we had to tighten the skates on our shoes. Some kids would play ‘kick the can’ also. We had skipping ropes which were great fun and good exercise for us. When the lawns dried up, out came the baseball bats and we would head for the parks, either 7th. Street Park or Memorial Park. On some streets we could play outside our houses or even on the roads for a bit as there weren’t many cars. Today you hardly see a kid on the streets except for later on when the skate boards come out. We may have had very little but we sure had fun with it. Ahhhh, those were the days!!! On the back pages of The Last Lamp ’69 of the Cornwall General Hospital School of Nursing yearbook 1969 are patron’ ads. So nice to see the ads again for some of the Cornwall stores such as : The Jade Restaurant & Tavern, Murray’s Credit Jewellers, Guaranty Trust Co., Roy’s Studios, The New Parkway Hotel, O. Charlebois Aluminum Products, Royal Bank, Singer Co. of Canada Ltd., Marilyn Shoppe, New York Cafe, Dorjean, Blanchet Fabric Sales, Cornwall Cable Vision 1961 Ltd., FDC Dealers of Cornwall , Warren-Pommier Jewellers, Irwin Supply Cornwall Ltd., The Advance Shop, Albert’s Dry Goods, Bunny’s Fashions Ltd., King George Restaurant, Laing’s, Clarke’s Shoe Store, Nyman’s Shoe Store, City Smoke and Colony Coffee Shop, Cornet Camera Shop, Whittaker Bros, Lowe Brothers Paint and Wallpaper, Ford’s Credit Jewellers, EDO, E.R. 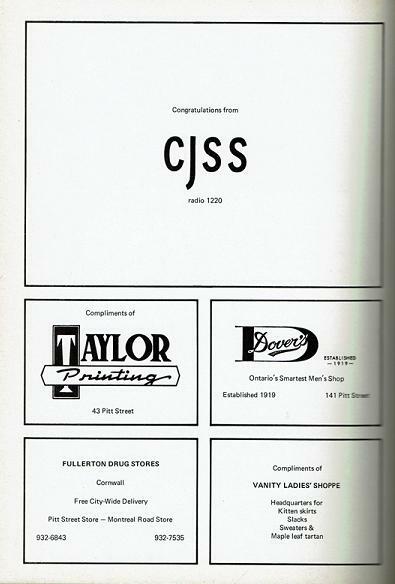 Fraser Jeweller, Smith Dominion Hardware and Compo Records among many others from out of town. Charlene Kaneb and Kent de Shane O.D. were also patrons. 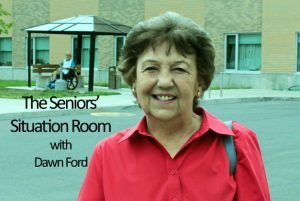 Support your community and the great work of Dawn by sponsoring this column! Or click the viewer donation button below. Our Jewish friends are celebrating Passover. According to some web sites on Passover (Pesach) it is a major Jewish spring festival commemorating the Israelites’ Exodus from Egypt over 3,000 years ago and their transition from slavery to freedom. It states that today it is a celebration of freedom and family. This year it is celebrated for 8 days from the evening of March 30th.to the evening of April 6th. Happy Passover to all our Jewish friends. The Family Corner Restaurant at 9th. Street and Pitt is in the Easter spirit. Henry Lague and his staff have decorated the restaurant with lots of bunnies and chicks. There is a nice Spring atmosphere in the restaurant as well with all the pretty decorations. Henry said that there is a rumour that the Easter Bunny may show up at the restaurant on Sunday. Don’t want to miss him. A couple of nice chocolate Easter Eggs would be a treat!! 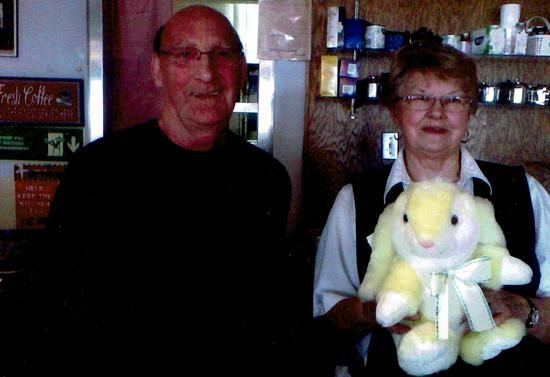 Here is a photo of Henry and a lovely waitress Shirley Brault who is showing me a little stuffed-toy bunny which was one of the many cute toys decorating the restaurant. 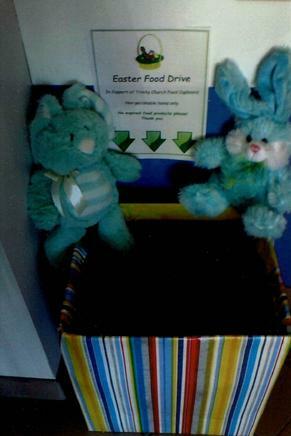 Beek Lindsay Seniors Residence is holding their annual Easter Food Drive to benefit The Food Cupboard at Trinity Anglican Church. A big thank you to Linda Roche and Ernie Appleton for their help and also a big thank you to Claudette Quesnel who took care of the groceries on a daily basis. Kudos to all who donated to help and share with those in need. 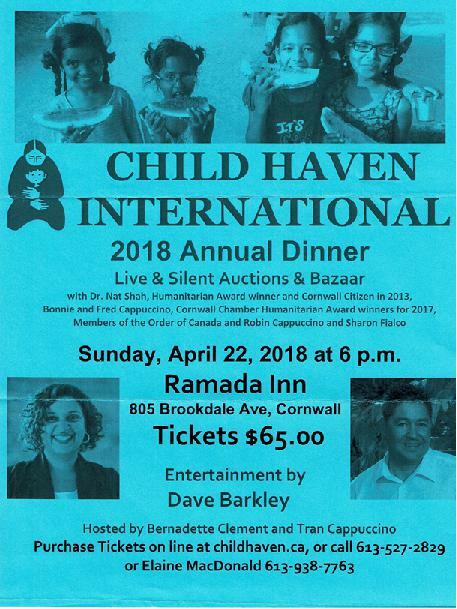 The Child Haven International 2018 Annual Dinner will be held at the Ramada Inn on Sunday April 22 at 6pm. Child Haven International is a not for profit charity which assists children and women in Bangladesh, Tibet in China, India and Nepal who are in need of food, shelter, education, health care, emotional and moral support. Child Haven was co- founded in 1985 by Fred and Bonnie Cappuccino and Dr. Nat Shah. According to their website, it is inspired by the ideals and philosophy of Mahatma Gandhi. The dinner will be hosted by Bernadette clement and Tran Cappuccino. 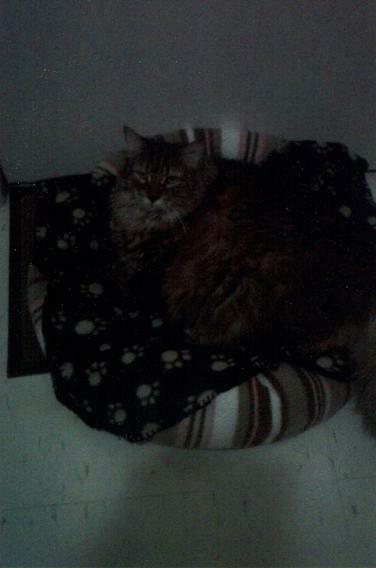 Here is that big baby cat of mine, Tiger Boy, in his bed in the hall. I ran out of boxes and thought maybe he would be warmer with a kitty blanket in his little bed on a mat on the floor. I don’t know why he likes to lay in that corner of the hall but he does. He loves it. A friend said that they didn’t know why I was so worried he would be cold with such a thick fur coat. Probably true but…just in case. Now he sleeps there during the night sometimes. With his very thick fur coat, it may be cooler some nights in the hall than in the bedroom. Cats know how to take care of themselves. He IS a pampered pet…a little Prince… but…..oh,so cute!!! The woman calmly called the police and explained what she had done. Great article as usual, Dawn. I had forgotten about some of the things we played in the schoolyard and were allowed to play. What fun we had, not costing much at all! !